Continuing the hunt for marginal gains, World Time Trial Champion, Sir Bradley Wiggins was seen to be using a new Zero Aero Speedplay pedal at the City RC 10-mile time trial on Saturday. Wiggins is said to favour Speedplay pedals owing to past knee injuries he has suffered, with the Zero Aero pedals first unveiled in prototype form at Inter Bike 2014. The Zero Aero differs from other Speedplay pedals, by being single sided. When the single sided pedal is clipped in, the dimples on the bottom create an aerodynamic profile that integrates with the cleat, which also features dimples. The golf ball like pattern is designed to create a smooth surface for the wind that maximises aerodynamic efficiency. Pink: The sock colour of choice for Sir Brad. 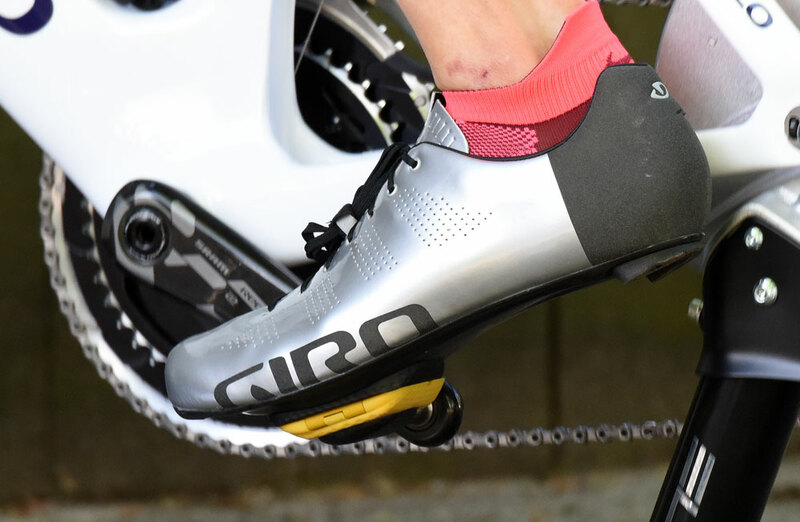 Here we can see how the cleat interfaces with the pedal, with Wiggins wearing his favoured Giro Empire shoes. The 2012 Tour de France winner is due to attempt to break the Hour Record on the 7th June, where we’ll see if Wiggins uses the Zero Aero Speedplays, with aerodynamic shoe covers, often seen in road time trials not allowed in the velodrome.